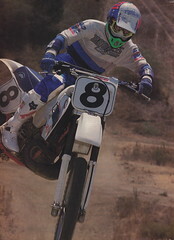 Here is another classic motocross shootout from my personal magazine collection. This one is from Dirt Bike and covers the Open class of 1998. In it, the revolutionary new Yamaha YZ400F four-stroke takes on the KTM 380SX, Kawasaki KX500 and Honda CR500R two-strokes for ultimate 500-class dominance.